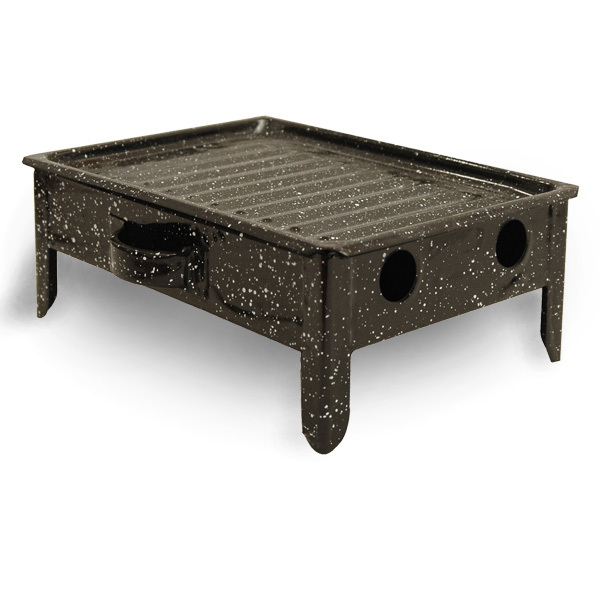 Ours is made of high quality durable cast steel, double coated with extra heavy glaze enamel and then kiln dried to a brilliant black with white speckles. After using, allow the Brasero to cool before washing as rapid swings in temperature may crack enamel. For everyday cleaning, hand washing in hot, soapy water and drying it thoroughly with a soft cloth before storing is recommended to maintain the best appearance of the Brasero. Since the exterior glaze enamel is kiln dried at 1,600° Fahrenheit, the surface is rather resilient and can even be scrubbed with a scrubber of steel wool to remove dried-on or burnt food. Another excellent cleaner for keeping the interior and exterior of the enamel shiny is Soft Scrub Cleanser. It is not necessary and not recommended to soak in water for an extended time.